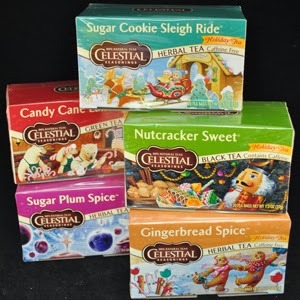 Finally I tried what I believe to be the last of the Celestial Seasonings Holiday Teas, the only one I think I have not tried. It is Sugar Cookie Sleigh Ride! It is kind of eerie how much like a sugar cookie this tea tastes like. However it is not as good as the great, the hallowed, the iconic Sugar Plum Spice, or Candy Cane Lane. Those are better. I really cannot decide if I like this tea or not. I do not think it is that good. Let us pause for a group shot. Hmmm. Come to think of it I have not yet tried Nutcracker Sweet. That will be next! I am remiss in not having tried it. Over Thanksgiving my nieces were impressed by my collection of tea. They are like me. They are crazy about it. 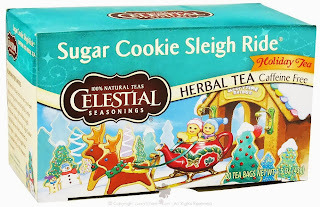 Meanwhile I agree with a reviewer on Amazon who says that Sugar Cookie Sleigh Ride is rather watery and not as flavorful as those other Celestial Seasonings teas, plus it has kind of an aftertaste. Plus it mysteriously mentions "natural flavors." What natural flavors? Consumers are saying it must contain stevia and I cannot say that I disagree. 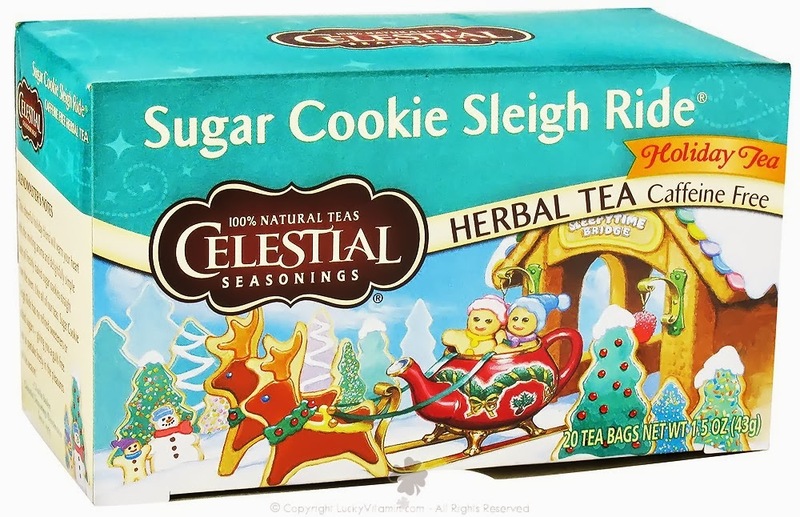 However Sugar Cookie Sleigh Ride, as some consumers pointed out, can satisfy your sweet tooth. It does feel as if you are drinking a cookie. Plus it has a great sounding first ingredient, more exotic than any of the ingredients in its holiday brethren. It is Milk Thistle! What does Milk Thistle do to you? Let me find out. Ah! It helps your comprehension of the art of Leonard Pennario. Oh wait. I misunderstood. It is good for nothing that afflicts or affects me. Still it is fun to add to my herbal medicine cabinet!